Inca Bridge brings you legends, facts and pictures of geological marvel, Puente del Inca, natural bridge over sulfuric waters of Rio de las Cuevas on the road from Mendoza to Santiago de Chile. The abundance of various minerals together with their unique chemical composition cause that soft objects exposed to the water are quickly impregnated by ferruginous ore hardening their shapes. Hard objects are simply covered by layers of deposits. 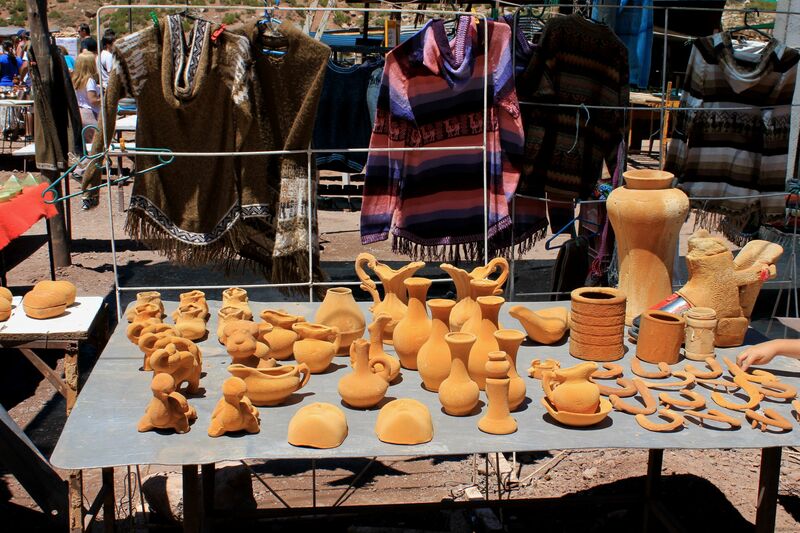 On the nearby craft fair with local wares, Andean stones, gems and souvenirs you will find all kind of solidified and fossilized stuff, like for example old shoes, sandals, bottles, boxes, mugs etc…. At the peak of its fame the Puente del Inca resort was a busy place. The legendary Trans-Andean Railroad (engineering marvel itself, linking Argentina with Chile via a long tunnel under the mountains) was “feeding” the spa with guests, visitors and tourists. Today the old railroad station with a web of tracks and an British-made infrastructure still witnesses the glory of the past. Till few years ago the thermal baths, hot water sources and ruins of the hotel were accessible to tourists. No more – since 2005 in an attempt to protect the place from crowds of visitors the whole area including the bridge is closed for public. The wooden railing along the left bank of the river sets the limits. On the right bank of the Rio de las Cuevas at the edge of the steep mountain overshadowing the narrow valley there is a small chapel. Miraculously the chapel was spared by the same avalanche that completely destroyed the hotel located just few tens of meters farther behind it. Today, the chapel remains lonely in this mountainous landscape proudly witnessing “unpredictable” and sometimes “incomprehensible” deeds of the Providence and/or Nature. Legends surrounding the Inca Bridge have common roots in the pre-Columbian times of the Inca Empire. Their starting point is pretty much similar – the heir to the throne of the Inca Empire was partially paralyzed. None of the known cures made the slightest change to the health of the poor Inca. Addressing the problem, wise men from the whole kingdom gathered in Cusco and advised the king that his son can be healed by the hot spring waters in the remote southern mountains. After the long and difficult march traversing the high mountains the king with his best warriors arrived at the bank of today’s Rio de las Cuevas. The healing springs were just right there across the deep ravine. To help their king, warriors clinging to each other quickly formed a human bridge. Then the Inca king carrying his son in his arms crossed the river over the backs of the soldiers. Indeed the cure worked out – after quenching his thirst with the waters from the healing source the king’s son regained health. Amazed king turned back to thank his warriors just to realize that in the meantime they turned into the “stone bridge” calcified by the flowing-through sulfuric waters…..Hence the name Puente del Inca (Inca Bridge). In a different version of the tale, it was Inca’s god Inti, who helping the king, dropped a huge stone from the top of the mountain creating the bridge over the troubled waters. Since then, the nearby Mount Aconcagua dominates the horizon standing on a guard and protecting Inti’s deeds. For many this may be the strongest fact proving the truthfulness of this tale. Well, one think is sure – the Inca Bridge was part of the vast network of roads spanning the Inca Empire. That alone perfectly justifies its name honoring Inca people – at the time of their peak controlling probably the largest ever empire on Earth or at least matching that of Alexander the Great. Last look at the spa and rainbow of colors and shapes created by the Mother Nature. Old shoes may have new value here :-). This lonely Chapel is all that escaped the destiny of the whole resort complex destroyed by an avalanche. Railroad station - Silent witness to the past glory and business of this place. On the track's switch you can read: "Ransones & Rapier Limited, London 1900. I hope you enjoyed the story and pictures of this marvelous place. But I know that being there is a different story greatly enhanced by the surrounding High Cordilleras, “spiced” by thinner air at 2700 meters of altitude and moon-like landscape. So whoever has a chance to “get on the road” connecting Mendoza with Santiago de Chile, just do it now! (Ouch, wait a moment – do it during the next local summer!). And keep in mind that the Trans-Andean road offers many striking tourist attractions worth of your attention.